The Excelsior Hotel and Casino. Built in Las Vegas in 1960 by mobster Louis “The Lip” LaFica. For decades the towering hotel has been the subject of incredible stories and rumors that have kept it in the public eye the world around. Why have so many lovers been mysteriously, magically, magnetically drawn to this magnificent edifice? And why now have so many bestselling authors at last come together to reveal the adventures of these lovers who have stayed at the glorious Excelsior? 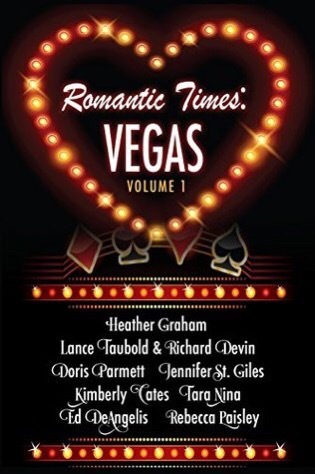 Romantic Times: Vegas by nine talented writers is amazing. I felt my adrenaline rushing through me as I raced through the pages. Fast-paced, thrilling, and full of action. This collection of romantic suspense tales was addictive. Danger, risks, and killers. The whole anthology was magaical. I loved reading each one of the short stories. Entertaining, dark, and susepsenful. Highly engaging from beginning to end. Some left me on the edge of my seat, others left me holding my breath, and other had my heart racing as the dangers escalated. Every page was well-written. All the characters were brilliant. Both the bad and good guys were realistic. Try not to have nightmares…overall, I recommend this stunning collection of fiction to readers worldwide.